1. What is the ACE/ASCAP/BMI Agreement and how does it help me? Answer: ACE National negotiated a substantial and EXCLUSIVE discount savings agreement with both ASCAP and BMI that saves our members a single 30-34% discount on each of their music licensing fees. Additionally, with ASCAP, if you own 2 or more clubs, you can combine them as a ‘multiple’ and pay the “base rate” only once. 2. What are some of the highlights of the program? Answer: The savings from the 30% discount are significant! For example, clubs with an occupancy rate of 150 will save over $500 a year, and clubs with an occupancy rate of 300 will save $850 a year. Clubs with higher occupancy rates will save even more. Operators of two or more clubs can combine their occupancy rates to achieve even greater savings, by paying a significantly lower effective rate per occupant and then getting the 30% discount off of that amount with ASCAP! BMI’s savings are a significant 34% discount! 3. How do I qualify and when does the discount program begin? Answer: You MUST be a member of ACE National to participate in the EXCLUSIVE discount programs and be current with your music licensing fees to both ASCAP and BMI. See below to learn how to join! ASCAP: The program begins January 1, 2019 and your licensing fees must be paid by February 21, 2019. BMI Licensing Discounts Begin, February 1, 2019 and your licensing fees must be paid by February 25, 2019. ACE contracts with a CPA who invoices you directly for 2019 fees. 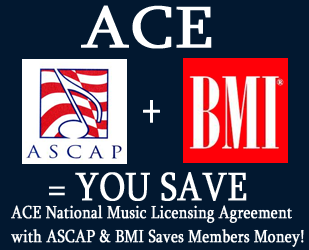 ACE places all members on a calendar year for ASCAP/BMI licensing fees. A. Click the Membership Tab at the top and fill in the blanks or contact Angelina Spencer, ACE National Executive Director @ aspencer@empowermentpr.com and she will add you to the member list, pending approval. Please have your ASCAP/BMI account numbers handy, along with your certificate of occupancy, name, DBA, address and website for your establishment. B. You must pay, to ACE National, a $199 per location annual membership fee we include on your first ASCAP invoice. The deadline for 2019 ASCAP/BMI discount is soon, so don’t delay! If you have more than one location, please remember to pay $199 per location. ACE accepts credit cards, checks or money order. 4. What if my license agreement renewed in September or even June 2019? Do I have to pay MORE to get into the discount program for 2019? How does that work? Answer: For ASCAP: If your current license already extends into 2019, you will get a credit for that portion of 2019 you already paid, which will be deducted from your bill for your 2018 license fee, which will be with the 30% discount. Depending on how far into 2018 a club has paid, some clubs may be entitled to a rebate. BMI requires a pro rata if you’re brand new to the program. For example, they require you to come current and pay the pro rata difference so that your fee schedule will coincide the the calendar year. ACE uses (February 1-January 31st). You are then credited the following year and admitted into the program, including your discount. 5. If I am not an ACE Member, can I still get the discount? Answer: No. You must be an ACE Member to participate. The negotiated agreement is exclusive to ACE Members only. The deadline for joining the 2019 ASCAP program is November 15, 2018. The deadline for joining the 2019 BMI discount Program is November 15, 2018. If you own clubs, becoming a member is EASY and we welcome you to our association! It’s as simple as filling sending us your information and paying your $199.00 per location annual membership on your first ACE-ASCAP invoice. *PLEASE NOTE: If you are approved for the ACE National music licensing discount programs, both BMI & ASCAP will still send you an invoice BEFORE you receive the ACE National invoice. If you have successfully participated in the previous year's discount program, you may ignore this invoice and wait for your ACE invoice. If you have questions about your membership account, please call the CPA above. Thank you.